The Huby and Sutton Show is an annual event held in the grounds of Sutton Park Stately Home, in the village of Sutton-on-the-Forest, just eight miles to the north of York. We have attended a couple of times and found it to be a very enjoyable day out for people of all ages. 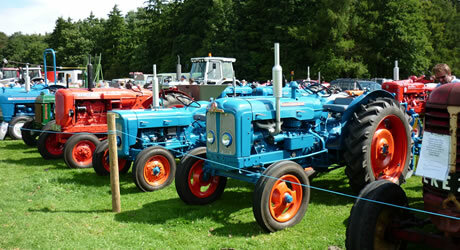 The event is largely an agricultural event with the showing of farm animals (including cattle, sheep), show-jumping, dog agility and displays of farm vehicles and vintage vehicles. There is a tent of smaller animals being shown including rabbits and chickens. In addition there are various stalls all over the grounds selling food, garden furniture, crafts and clothing and a marquee of homemade crafts and produce. There is a programme of children's entertainment throughout the day and plenty to keep younger visitors interested. This year (2011) the Huby and Sutton Show will be held on Sunday 31 July and looks to offer the usual fun events and attractions. This entry was posted on Friday May 20th, 2011 at 4:30 PM and is filed under Places to Visit, Things to do.You can follow any responses to this entry through the RSS 2.0 feed. You can leave a response.